We now have a version of IPython, using the new two-process ZeroMQ Kernel, running in a PyQt GUI. This is a very lightweight widget that largely feels like a terminal, but provides a number of enhancements only possible in a GUI, such as inline figures, proper multiline editing with syntax highlighting, graphical calltips, and much more. 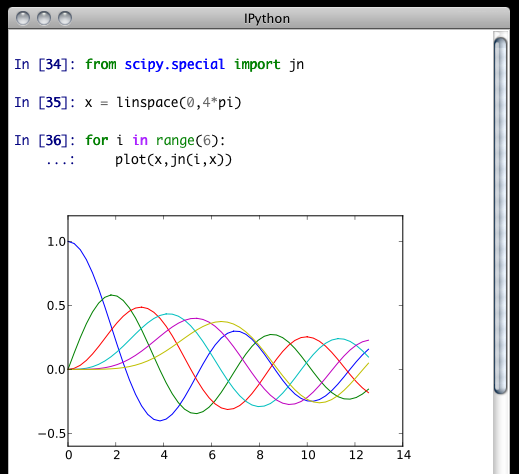 The Qt console for IPython, using inline matplotlib plots. To get acquainted with the Qt console, type %guiref to see a quick introduction of its main features. The Qt frontend has hand-coded emacs-style bindings for text navigation. This is not yet configurable. Since the Qt console tries hard to behave like a terminal, by default it immediately executes single lines of input that are complete. If you want to force multiline input, hit Ctrl-Enter at the end of the first line instead of Enter, and it will open a new line for input. At any point in a multiline block, you can force its execution (without having to go to the bottom) with Shift-Enter. The new %load magic (previously %loadpy) takes any script, and pastes its contents as your next input, so you can edit it before executing. The script may be on your machine, but you can also specify an history range, or a url, and it will download the script from the web. This is particularly useful for playing with examples from documentation, such as matplotlib. 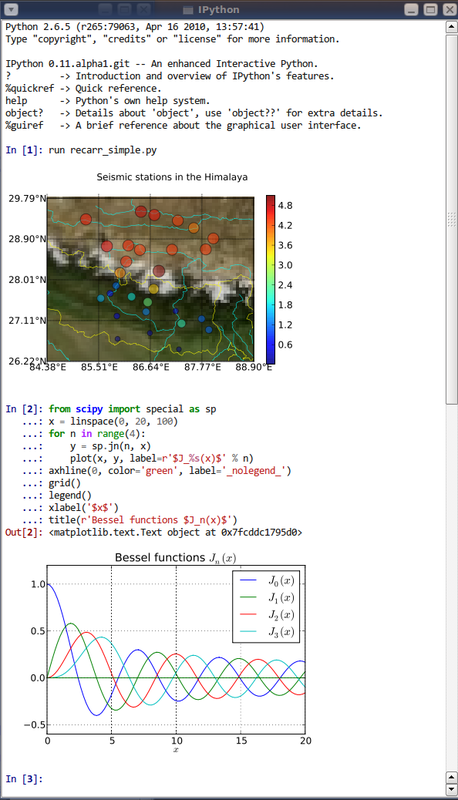 One of the most exciting features of the QtConsole is embedded matplotlib figures. You can use any standard matplotlib GUI backend to draw the figures, and since there is now a two-process model, there is no longer a conflict between user input and the drawing eventloop. 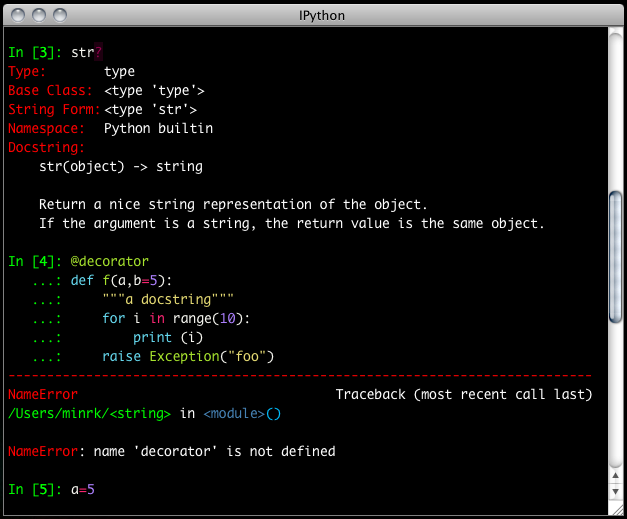 IPython provides a function display() for displaying rich representations of objects if they are available. The IPython display system provides a mechanism for specifying PNG or SVG (and more) representations of objects for GUI frontends. When you enable matplotlib integration via the %matplotlib magic, IPython registers convenient PNG and SVG renderers for matplotlib figures, so you can embed them in your document by calling display() on one or more of them. This is especially useful for saving your work. # Updated plot with title is shown here. If you want to have all of your figures embedded in your session, instead of calling display(), you can specify --matplotlib inline when you start the console, and each time you make a plot, it will show up in your document, as if you had called display(fig)(). Changing the inline figure format also affects calls to display() above, even if you are not using the inline backend for all figures. IPythonQt has the ability to save your current session, as either HTML or XHTML. If you have been using display() or inline matplotlib, your figures will be PNG in HTML, or inlined as SVG in XHTML. PNG images have the option to be either in an external folder, as in many browsers’ “Webpage, Complete” option, or inlined as well, for a larger, but more portable file. Or, you can add the same line (c.Inline... instead of %config Inline...) to your config files. The widget also exposes the ability to print directly, via the default print shortcut or context menu. Saving is only available to richtext Qt widgets, which are used by default, but if you pass the --plain flag, saving will not be available to you. See these examples of png/html and svg/xhtml output. Note that syntax highlighting does not survive export. This is a known issue, and is being investigated. The Qt widget has full support for the colors flag used in the terminal shell. The Qt widget, however, has full syntax highlighting as you type, handled by the pygments library. The style argument exposes access to any style by name that can be found by pygments, and there are several already installed. The colors argument, if unspecified, will be guessed based on the chosen style. Similarly, there are default styles associated with each colors option. Calling ipython qtconsole -h will show all the style names that pygments can find on your system. With the two-process ZMQ model, the frontend does not block input during execution. This means that actions can be taken by the frontend while the Kernel is executing, or even after it crashes. The most basic such command is via ‘Ctrl-.’, which restarts the kernel. This can be done in the middle of a blocking execution. The frontend can also know, via a heartbeat mechanism, that the kernel has died. This means that the frontend can safely restart the kernel. Other frontends can connect to your kernel, and share in the execution. This is great for collaboration. The --existing flag means connect to a kernel that already exists. Starting other consoles with that flag will not try to start their own kernel, but rather connect to yours. kernel-12345.json is a small JSON file with the ip, port, and authentication information necessary to connect to your kernel. By default, this file will be in your default profile’s security directory. If it is somewhere else, the output line will print the full path of the connection file, rather than just its filename. If you need to find the connection info to send, and don’t know where your connection file lives, there are a couple of ways to get it. If you are already running an IPython console connected to the kernel, you can use the %connect_info magic to display the information necessary to connect another frontend to the kernel. if this is the most recent IPython session you have started. This is actually exactly the same as the subprocess launched by the qtconsole, so all the information about connecting to a standalone kernel is identical to that of connecting to the kernel attached to a running console. Since the ZMQ code currently has no encryption, listening on an external-facing IP is dangerous. You are giving any computer that can see you on the network the ability to connect to your kernel, and view your traffic. Read the rest of this section before listening on external ports or running an IPython kernel on a shared machine. If you specify the ip as 0.0.0.0 or ‘*’, that means all interfaces, so any computer that can see yours on the network can connect to the kernel. Messages are not encrypted, so users with access to the ports your kernel is using will be able to see any output of the kernel. They will NOT be able to issue shell commands as you due to message signatures, which are enabled by default as of IPython 0.12. If you disable message signatures, then any user with access to the ports your kernel is listening on can issue arbitrary code as you. DO NOT disable message signatures unless you have a lot of trust in your environment. The contents of this file will be stored in the JSON connection file, so that file contains everything you need to connect to and use a kernel. Sometimes you want to connect to machines across the internet, or just across a LAN that either doesn’t permit open ports or you don’t trust the other machines on the network. To do this, you can use SSH tunnels. SSH tunnels are a way to securely forward ports on your local machine to ports on another machine, to which you have SSH access. In simple cases, IPython’s tools can forward ports over ssh by simply adding the --ssh=remote argument to the usual --existing... set of flags for connecting to a running kernel, after copying the JSON connection file (or its contents) to the second computer. Using SSH tunnels does not increase localhost security. In fact, when tunneling from one machine to another both machines have open ports on localhost available for connections to the kernel. There are two primary models for using SSH tunnels with IPython. The first is to have the Kernel listen only on localhost, and connect to it from another machine on the same LAN. Note again that this opens ports on the client machine that point to your kernel. the ssh argument is simply passed to openssh, so it can be fully specified user@host:port but it will also respect your aliases, etc. in .ssh/config if you have any. The IP here is the address of worker as seen from login, and need only be specified if the kernel used the ambiguous 0.0.0.0 (all interfaces) address. If it had used 192.168.1.123 to start with, it would not be needed. The -f -N on the end are flags that tell ssh to run in the background, and don’t actually run any commands beyond creating the tunnel. Since there can be many consoles per kernel, the shutdown mechanism and dialog are probably more complicated than you are used to. Since you don’t always want to shutdown a kernel when you close a window, you are given the option to just close the console window or also close the Kernel and all other windows. Note that this only refers to all other local windows, as remote Consoles are not allowed to shutdown the kernel, and shutdowns do not close Remote consoles (to allow for saving, etc.). Restarting the kernel automatically clears all local Consoles, and prompts remote Consoles about the reset. Shutdown closes all local Consoles, and notifies remotes that the Kernel has been shutdown. Remote Consoles may not restart or shutdown the kernel. Now the QApplication itself holds a reference to win, so it will never be garbage collected until the application itself is destroyed. First start IPython, and then start the external Qt application from IPython, as described above. Effectively, this embeds your application in IPython rather than the other way round. Use IPython.qt.console.rich_ipython_widget.RichIPythonWidget in your Qt application. This will embed the console widget in your GUI and start the kernel in a separate process, so code typed into the console cannot access objects in your application. Start a standard IPython kernel in the process of the external Qt application. See examples/lib/ipkernel_qtapp.py for an example. Due to IPython’s two-process model, the QtConsole itself will live in another process with its own QApplication, and thus cannot be embedded in the main GUI. Start a special IPython kernel, the IPython.kernel.inprocess.ipkernel.InProcessKernel, that allows a QtConsole in the same process. See examples/inprocess/embedded_qtconsole.py for an example. While the QtConsole can now be embedded in the main GUI, one cannot connect to the kernel from other consoles as there are no real ZMQ sockets anymore. !cmd input: Due to our use of pexpect, we cannot pass input to subprocesses launched using the ‘!’ escape, so you should never call a command that requires interactive input. For such cases, use the terminal IPython. This will not be fixed, as abandoning pexpect would significantly degrade the console experience.